By Jake Taylor; Last Thursday I was lucky enough to attend the press opening of Winter Wonderland in Hyde Park. For anyone who doesn’t know what Winter Wonderland is, it is a fun fair/ theme park with Bavarian style food and drink. 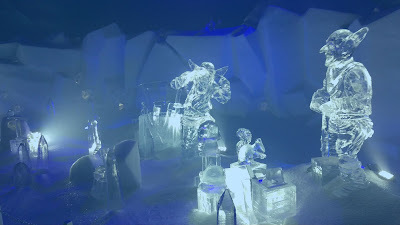 The attraction has a lot of things to do, such as, fun houses, slides, ice skating, a giant Ferris wheel, a magical ice kingdom and more! Winter Wonderland is free to enter (a cheap day out, I know!) however you can pay for food, drink and attractions inside the venue. If you would like to ice skate around the Ski Zillertal ice rink, tickets starts from as little as £9.50 for students and you can book your slot in advance. Having gone to Winter Wonderland in previous years, I recommend that you go in the evening when it is dark; that way, you can walk around when all the lights are on and it is a lot more Christmassy and prettier. When you walk up to the entrance of Winter Wonderland you are greeted by an abundance of shops that sell Christmas themed gifts such as scented candles, woolly hats, stuffed animals and more. It is nice to browse the stores and see what they have to offer, you may see a lot of things you like for a decent price. All of the shops look like wood cabins so it keeps to the theme of winter and gives you that warm, cosy feeling. 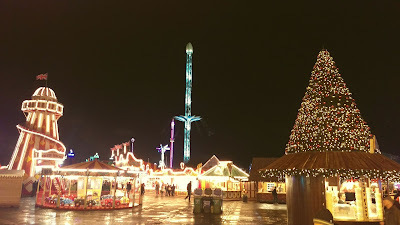 The food and drinks at Winter Wonderland are very good; there are many places to buy from, such as; The Famous Bavarian Village, Bar Ice, Mr Fogg’s Cocktail Bar and Grizzly Inn. When I was ready to eat I chose to go to The Famous Bavarian Village as there was the most choice there. My personal favourite is the Pork Roll because it is very tasty and you get a choice of more than just pork, you get the choice of having the traditional scratchings with it as well as apple sauce. Get both toppings! You won’t regret it because they are absolutely excellent. You can also buy tasty treats such as churros which are also very good. What is a churro I hear you ask? Well, it is almost like a donut with sprinkled sugar and/or cinnamon on top, it’s all very good. With drinks you have a lot of choice, Bavarian style beers, different types of mulled wine, mulled cider, soft drinks and much more line the shelves of the various drink huts that are scattered around the park. If you’re looking for a quirkier form of entertainment, all you need to do is hop into the fun house. The fun house is great for all of the family and gives everyone a smile on their face; it is well worth parting with the extra cash. If you’re not feeling the fun house then there is also a big Ferris wheel where you can chill and observe all of the scenery. Overall, Winter Wonderland is well worth a visit and should definitely be kept in mind when choosing what to do in London. Hyde Park is just a hop, skip and a jump away from our English Centre in Greenwich via the Jubilee Line (North Greenwich to Bond Street). Have you been to Winter Wonderland yet? Share your pictures and thoughts with us on Facebook and Twitter.